(1891) Thursday January 1st 1891 It was a rainy day and we could not go out to Fannys to the New Years dinner. Will went to town awhile. Lee came home today I worked in the rags all day and all the evening. Friday January 2nd 1891 I worked in the rags from breakfast till bedtime. Lee went back tonight. It was rather a wintry day. Will was busy about the place all morning and to town in the afternoon. Saturday January 3rd 1891 I worked with the rags all forenoon and evening and Will took me over to Fannys to spend the afternoon. Hattie was [not?] there. The roads are very rough. Sunday January 4th 1891 It was a pleasant morning and Will took me over to church and brought me back. He did not take time to get ready to go. I read in the afternoon and wrote in the evening The Whelstones were over a little while. 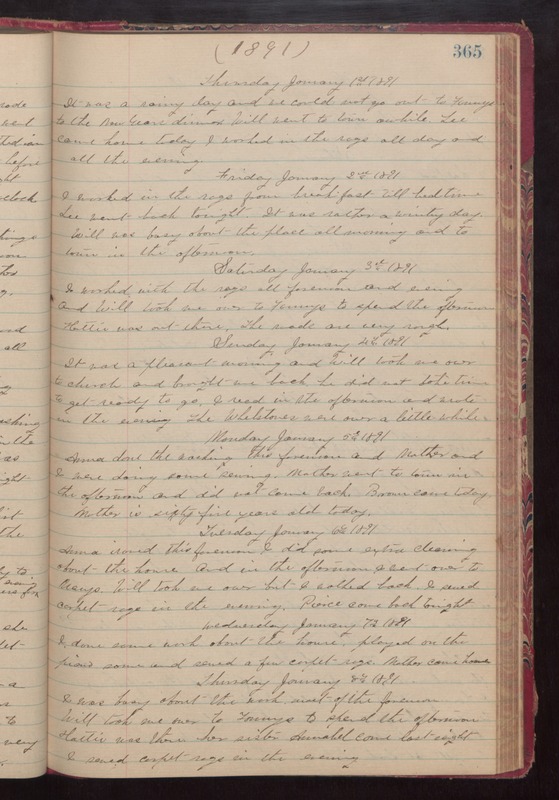 Monday January 5th 1891 Anna done the washing. This forenoon and Mother and I were doing some sewing. Mother went to town in the afternoon and did not come back. [Brown?] came today. Mother is sixty five years old today. Tuesday January 6 1891 Anna ironed the forenoon I did some extra cleaning about the house and in the afternoon I went over to Marys. Will took me over but I walked back. I sewed carpet-rags in the evening. Pierce came back tonight. Wednesday January 7th 1891 I done some work about the house, played on the piano some and sewed a few carpet-rags. Mother came home Thursday January 8th 1891 I was busy about the house most of the forenoon. Will took me over to Fannys to spend the afternoon. Hattie was there her sister Annabel came last night. I sewed carpet-rags in the evening.